Love 'em or hate 'em﻿ dandelion flowers are a part of each Spring and early Summer. They have a tendency to hunker down when you run a lawnmower over them, laying there waiting until the 'coast is clear' so they can once again straighten up and stand tall - one of the very reasons my husbands dislikes them so much! But when the girls were small dandelion puffs held a magical quality that made the backyard a place full of possiblities and hope. Ever since our oldest daughter was just a toddler dandelions puffs have been called 'wishberries'.... One day I sugggested she make a wish before she blew the feathery seeds off the stem and her sweet imagination took over and the name 'wishberry' was assigned to the humble little seed puff. Like birthday candles or cutting the first slice of cake, wishberries give each of us an opportunity to make a silent request... a tiny moment of time in which to prioritize our real wants and needs... a moment of joy just thinking on the possiblility of that wish coming true! With abundant opportunity to make as many wishes as you want, step outside and act like a kid again! 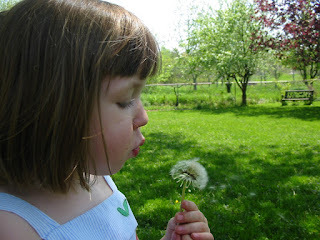 Pluck up a dandelion puff, make a wish and blow every seed off the stem! Same at our house : ) I still like the memory of how happy I felt blowing those "puff balls" and making a wish! Sweet photo.